*Offer applies to bookings for selected Thomas Cook and Airtours branded package holidays made at this store 14 weeks or more before departure. £0 deposit applies only if you sign up to pay the holiday cost by monthly Direct Debit instalments. Charges will apply if Direct Debit is not set up, or if you (or we) have reason to cancel your booking or your Direct Debit plan. For full terms & conditions please ask in store. Offer can be withdrawn or altered without notice. 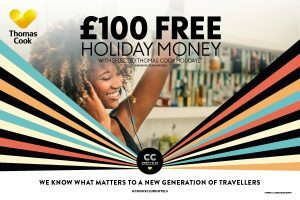 All holidays are subject to availability and booking conditions, and are operated by Thomas Cook Tour Operations Ltd, ATOL protected 1179, ABTA V6896. TCCT Retail Ltd, ABTA L8164, is acting as booking agent. 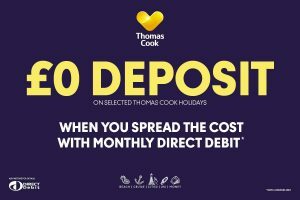 *Saving is per booking and applies to selected Thomas Cook and Airtours branded package holidays flying with Thomas Cook Airlines and departing between 1 May 2019 and 31 October 2020. Saving is either £150 based on a minimum holiday spend of £4,000, £100 based on a minimum holidays spend of £1,500 or £50 based on a minimum holiday spend of £800. Saving does not apply to room and board supplements, optional flight or other extras or child prices and cannot be combined with any other offer or discount. Offer is available for a limited time only and can be withdrawn or altered without notice. 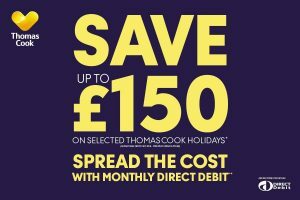 **Applies to selected Thomas Cook, Airtours and Manos branded package holidays booked 14 weeks or more before departure. You must pay a low deposit when booking and sign up to pay remaining holiday cost by monthly Direct Debit instalments. Charges will apply if Direct Debit is not set up, or if you (or we) have reason to cancel your booking or your Direct Debit plan. For full terms & conditions please ask in store. Holidays are subject to availability and booking conditions and are operated by Thomas Cook Tour Operations Ltd, ATOL 1179, ABTA V6896. TCCT Retail Ltd (ABTA L8164) acts as booking agent. Lyk™ is issued by R. Raphael & Sons plc, pursuant to license by Mastercard International Inc. Mastercard is a registered trademark, and the circles design is a trademark of Mastercard International Incorporated. R. Raphael & Sons plc is a UK bank authorised by the UK Prudential Regulation Authority and regulated by the UK Financial Conduct Authority and the UK Prudential Regulation Authority (registration number 161302) and is permitted to issue e-money. Head office and registered office at 19-21 Shaftesbury Ave, London, W1D 7ED, company registration number 1288938. R. Raphael & Sons plc is not licensed by the Guernsey Financial Services Commission to take deposits. Deposits made with R. Raphael & Sons plc are not covered by the Guernsey Banking Deposit Compensation Scheme.